A loan of $700 helped to increase his float and ensure that he has a sufficient amount to assist his daily cash-in/cash-out customers. Ndamyo is a proud entrepreneur. 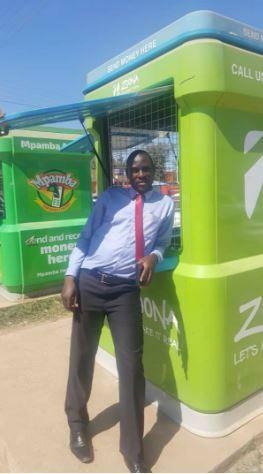 He runs a Zoona mobile money business and he speaks of the impact that he has made to the community through his business. By bringing financial inclusion, many people in and around Mzimba now have access to financial services as Ndamyo has made it easier for them to send and receive money. Ndamyo only started this business to compliment his salary but now it has become the life support of his household. He relies on the income he generates from the business to take care of his three children as well as support his extended family. Ndamyo runs his business with the assistance of his wife who is small-scale farmer. Currently, Ndamyo's business faces liquidity challenges. The working capital he operates with is not enough to assist with cash-in/cash-out transactions. He often has to rush to the bank during trading hours each time he runs out of either cash or electronic float and this process inconveniences his customers. Ndamyo reaches out to the Kiva community for assistance in the form of a loan. With the Kiva loan, he will increase his float and ensure that he has a sufficient amount to assist his daily customers. Ndamyo has had a Kiva loan before and he promises to utilize this one the same way. It enables an entrepreneur to improve their mobile money business. This loan provides short-term liquidity assistance to qualifying Zoona customers to allow them to make mobile money payments when their electronic balance is too low to meet their immediate business needs. The loan is intended to provide borrowers with a boost to their electronic float to allow them handle more revenue generating transactions and also give them a means to support transactions during peak demands. The borrowers will be able to draw down their electronic advance on a per-transaction basis. There are no monthly repayments, rather the borrowers will earn less commission on per transaction basis on the funds utilized from the advance. The full advance will be repaid to Kiva at end of the term. Zoona is a mobile money operator in Africa that invests in emerging entrepreneurs who provide financial services to underserved communities. Zoona gives entrepreneurs an opportunity to build their own businesses and create wealth and employment through mobile payment solutions, financial services, business management tools and support. Kiva loans provide mobile banking service agents with funding for fixed asset purchases and working capital to manage cash transaction requests. By supporting this loan, you're helping create employment opportunities throughout the borrower's community. Kiva has listed Zoona's "average cost to borrow" as N/A due to the unique nature of their loans and fees. For Zambian borrowers, there's a fee of 0.05% - 0.15% for optional short-term cash advances to cover immediate business needs when necessary. For Malawian borrowers, Zoona does not currently charge a fee. Zoona is introducing financial inclusion technology to southern Africa. Zoona's unique model of enabling emerging entrepreneurs to provide mobile money services to consumers has the potential to significantly push the boundaries of financial inclusion in Africa.